The City of Port St. Lucie is proud to be a hometown where people live, learn, work and play, and celebrate all of life’s opportunities and dreams. With 166,000 residents, Port St. Lucie is Florida’s ninth largest city by population. It occupies an area of 116 square miles in St. Lucie County on Florida’s east coast, about 50 miles north of West Palm Beach, half way between Miami and Orlando. Average temperatures range from 64 degrees in February to 82 degrees in August, making the city and surrounding area a tourist destination and nature lover’s paradise. The attractive environment and top-rated park system stand out in southeast Florida, and the unspoiled river, top-rated golf courses and growing arts and performance community are key reasons for the city’s growth in recent years. 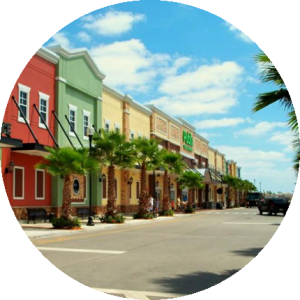 Port St. Lucie also attracts a vibrant mix of people because of its low crime rate, diverse housing stock and abundant open space, and because of the optimistic vision of the people who live here. As a new hub for biotech research and life sciences, the city offers diverse economic opportunities, clear guidelines for prosperous and sustainable growth, and state-of-the-art infrastructure ready to support development and investment. Additionally, the city government is committed to delivering outstanding public services that enhance the community and the quality of life for people of all ages. There are traditional suburban neighborhoods, new mixed-use neighborhoods with a variety of housing types in walking distance to retail and dining establishments, and the beginning stages of a downtown that is integrating urban commercial development with outdoor nature trails, waterways and social opportunities.